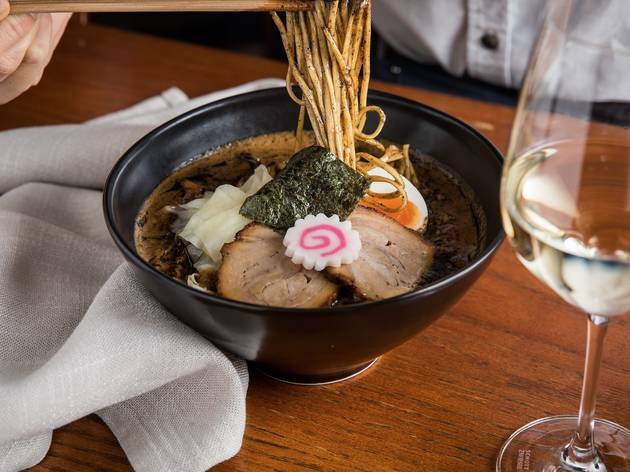 In a perfect world, we'd spend every night enjoying fine cuisine at Sydney's most indulgent restaurants. 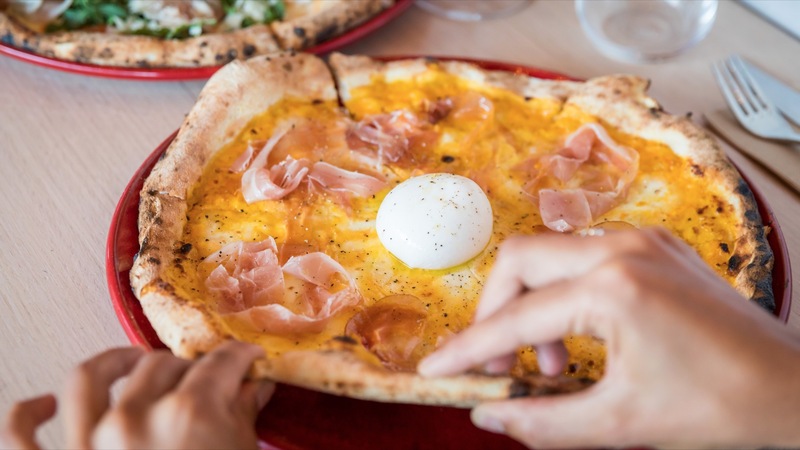 We'd be at Quay and Rockpool Bar & Grill... anywhere, really, that requires half (or all, or far more than) what's currently in your bank account for a shared plate. But we do not live in a perfect world – sometimes the stove is broken, the thought of checking your balance makes you break out in hives and skipping meals seems a viable option. But you don't have to do that! 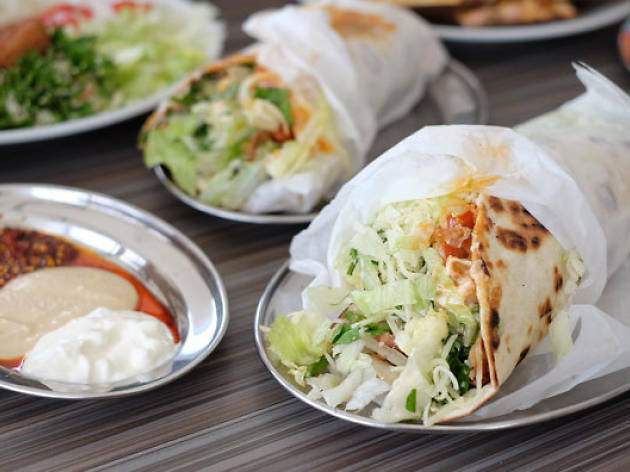 There's a host of cheap restaurants in Sydney serving up tasty food at prices that won't leave a hole in your finances. 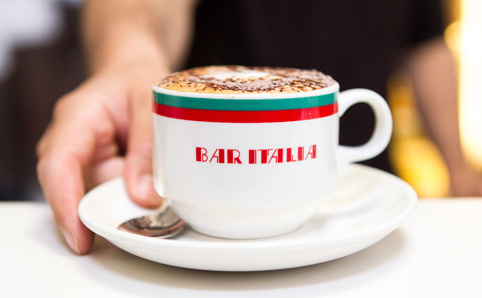 In fact, there's plenty of fun to be had in Sydney on a shoestring budget, starting with these 25 things to do in in Sydney under $25. 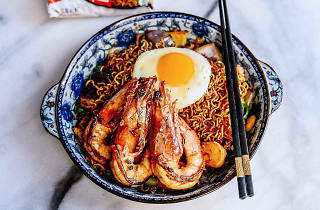 Or maybe you want to know where to get a cheap meal every night? 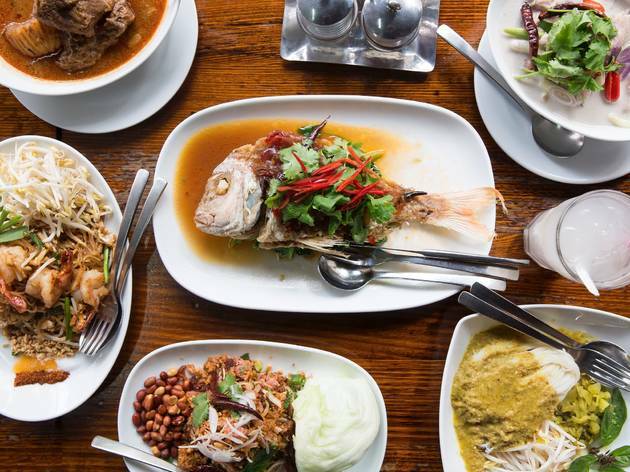 If you’re craving authentic Malaysian food, save your airfares and head to Haymarket. The char koay teow here is spectacular: juicy chinese sausage, bean sprouts, egg, green onion and charred flat rice noodles wearing wok breath like a heady perfume. 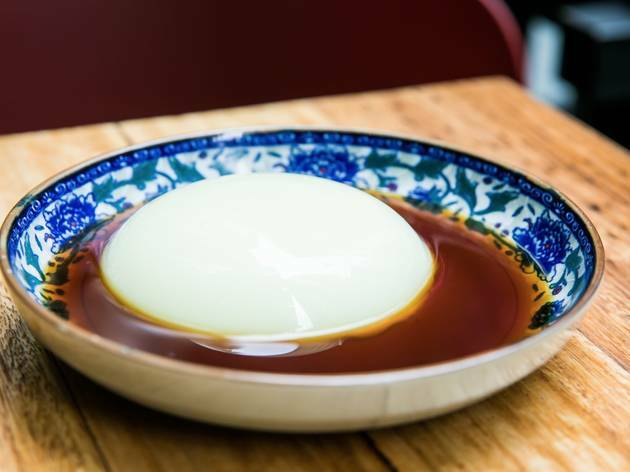 A Vietnamese diner in Sydney’s south offers inventive takes on the classics including coconutty pancakes, crunchy pig’s head nuggets and fresh banh mi. 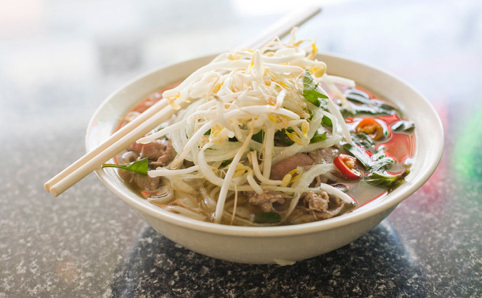 The other must-order is the beef noodle soup from Central Vietnam that is a cousin to the more famous pho. 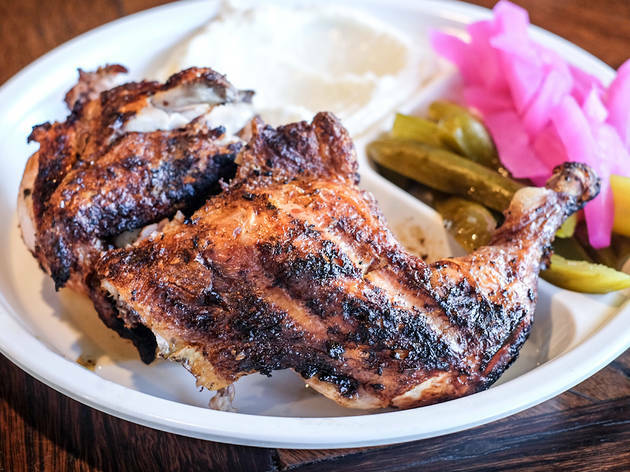 It's rare to fill two bellies for a twenty dollar bill plus some shrapnel in Sydney, but at this beloved chicken shop a whole charcoal chook, garlic sauce, pickles and bread is a meal for a king on a pauper's budget. 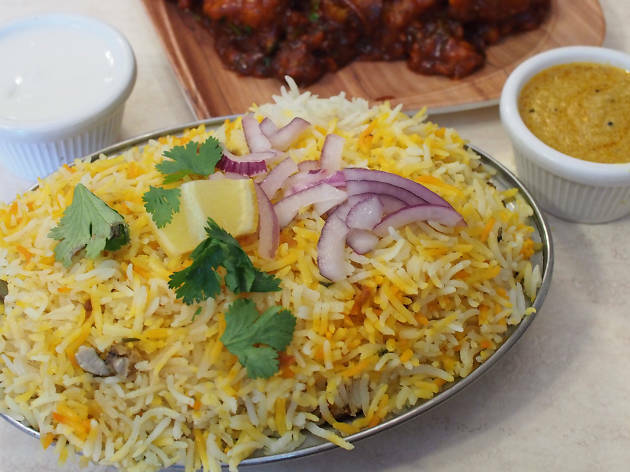 Order the chicken biryani (or the lamb, if they haven’t run out already) and revel in the mosh pit of spiced up basmati rice, each grain tinted in varying shades of butter yellow and saffron orange. 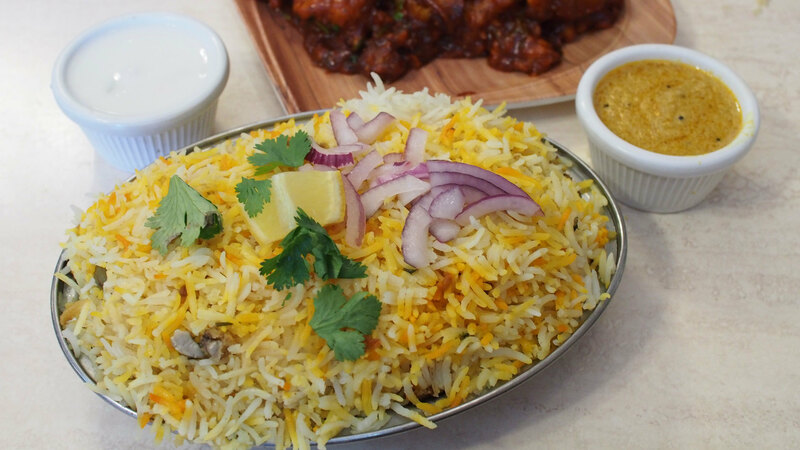 Tandoori chicken is another specialty and if you’re vegetarian, relax, eleven curries await. 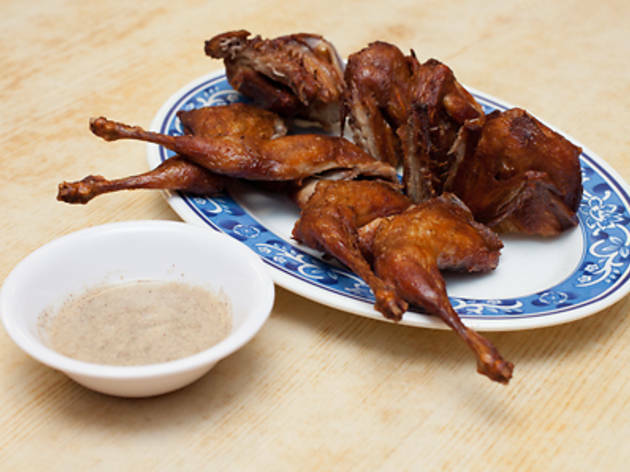 They brine their chook for 24 hours, coat it in spices, cook it in a vacuum bag, bath it in buttermilk, batter it and fry it. 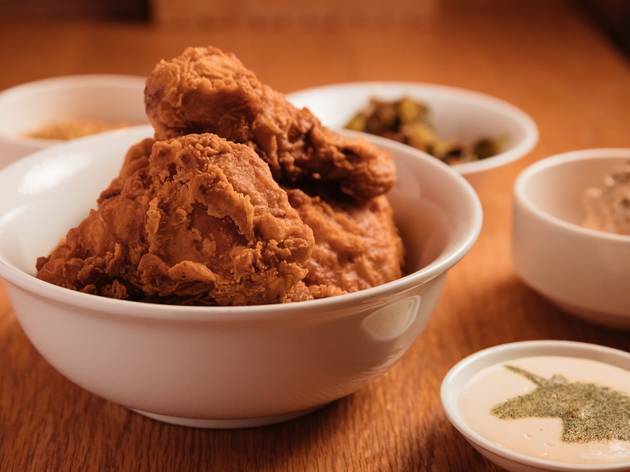 The crisp batter makes for the perfect jagged vessel to swipe up different sauces, and those condiments are worth a visit in their own right. 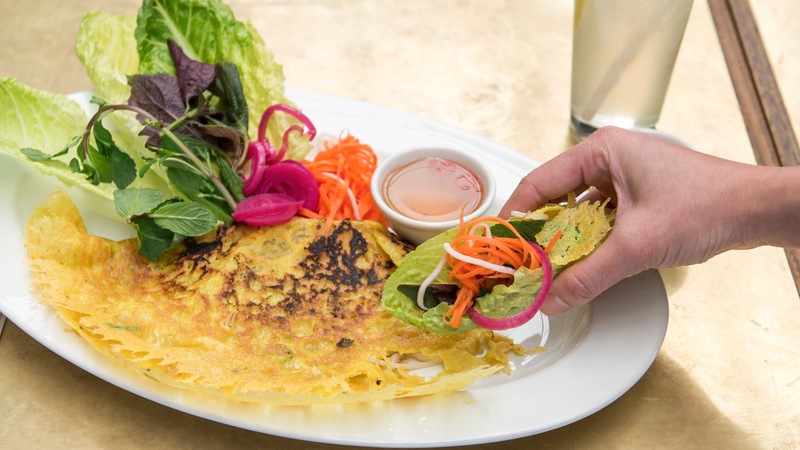 Omelette in a sour Thai soup does not sound like it should work, but, goddamn, if it isn’t a delicious revelation at number 79 on Spice I Am’s famously lengthy menu. At 82 items long, those A3, double-sided, laminated menus have been keeping flavour fossickers on their toes for 14 years. 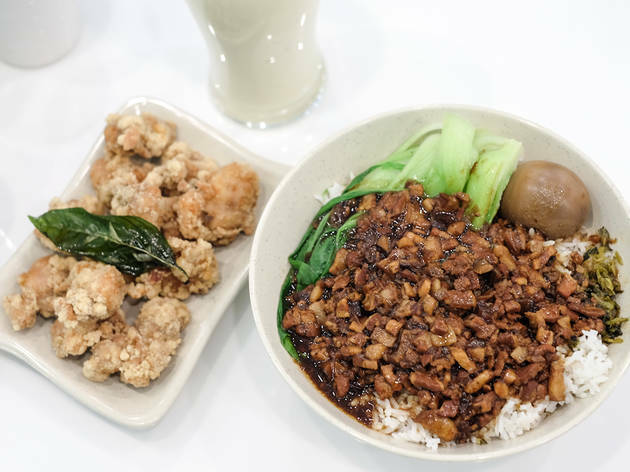 This old faithful is famous for hand-pulled noodles with pork mince and light-as-a-feather dumplings. 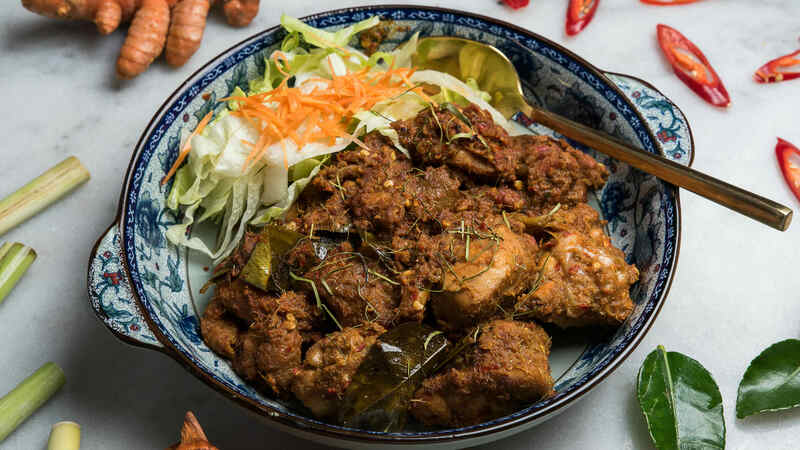 Pork and chive are an essnetial order – get them pan-fried, steamed or boiled – but don't overlook the eggplant bathed in a searing hot special sauce and intensely garlicy bok choy. In moving to a CBD food court, what it may have lost in suburban charm is has made up for in regular accessibility. 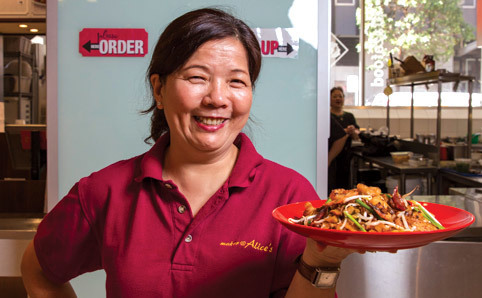 Is Alice Tan's char kway teow still the best in town? It certainly gives its competition (Jackie's in Concord being the other big favourite among CKT fanatics) a run for its moneybags. 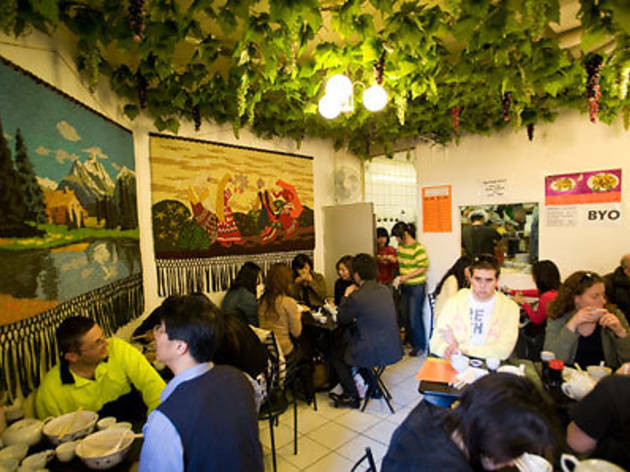 Did you know that above Chinatown’s dingy-but-dependable food court, Eating World, is one of the hottest dining tickets in Haymarket? 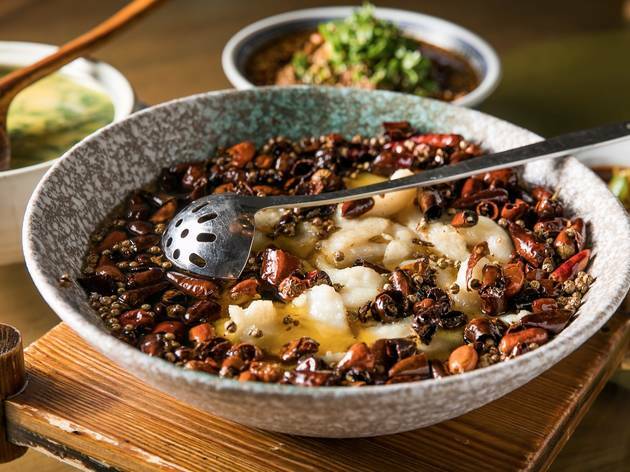 Spicy Joint, a wildly popular Sichuan chain in China, has expanded south – bringing peppercorn-littered braises, fiery hotpots and nightly queues to Dixon Street. Fourth generation butcher Anthony Puharich has conquered Glebe with meat, three times over (raw and ready to purchase, dried to snack on and smoked to dine in on). 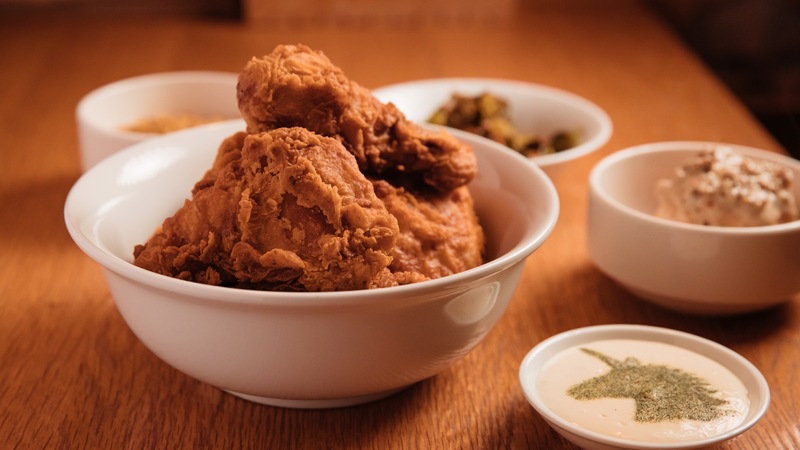 The burgers are excellent, the smoked chicken wings are juicy as and the brisket sandwich is worth slugging your way across the city on a rainy day to fulfil your braised meat dreams. 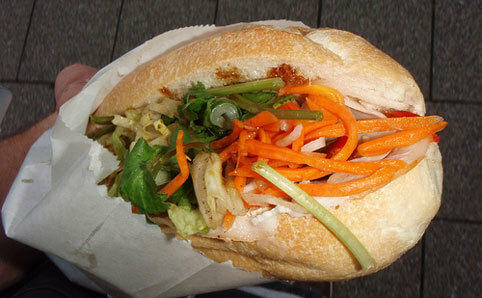 Banh mi are almost a Sydney religion and here they make them cheap and crunchy. Pick your preference when it comes to choosing chilli, pate and the special sauce (make sure you get it all). 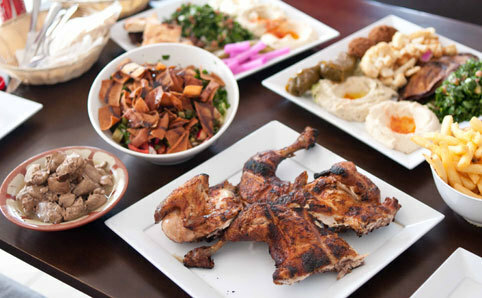 There is the traditional pork (a cold cut combo), deep pink barbecue pork, crackling pork belly, chicken or dense meatballs. The arepa is everything to Venezuelans, a gluten-free cornmeal patty eaten plain or split open and stuffed with meat or beans. 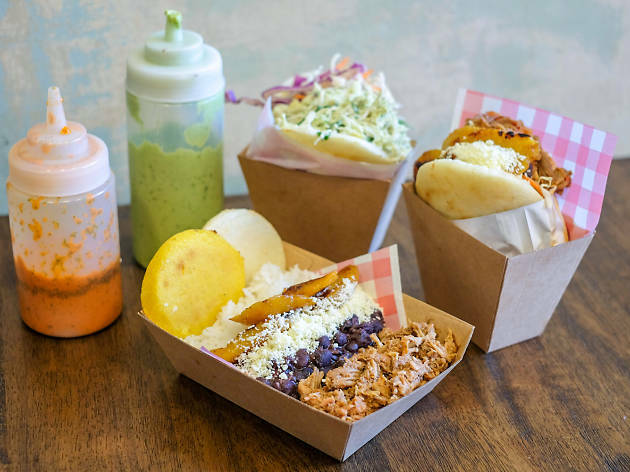 La Reina’s digs in Newtown finally offer a permanent address for arepa fans to get their fix. 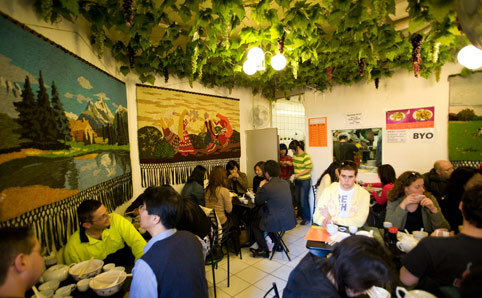 This small but cheerful eatery is already hugely popular with homesick South Americans. 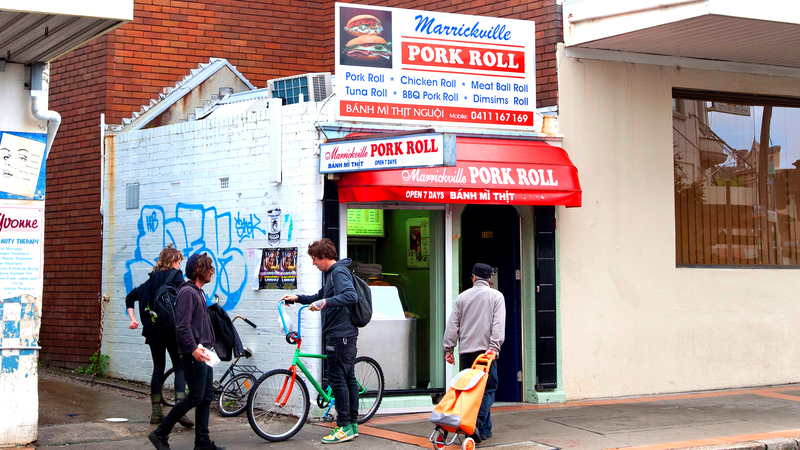 The queues form early for lunch at this CBD staple, but they also move swiftly. 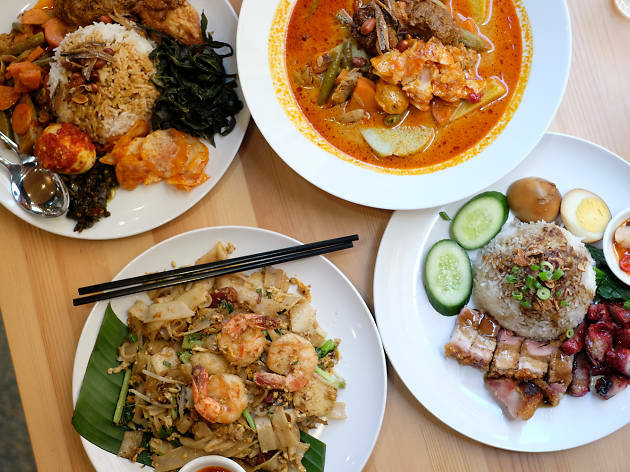 The kitchen here bangs out trays of mixed Malaysian curries and Hainanese chicken at a terrific rate, but the laksa is a very hard proposition to pass up. 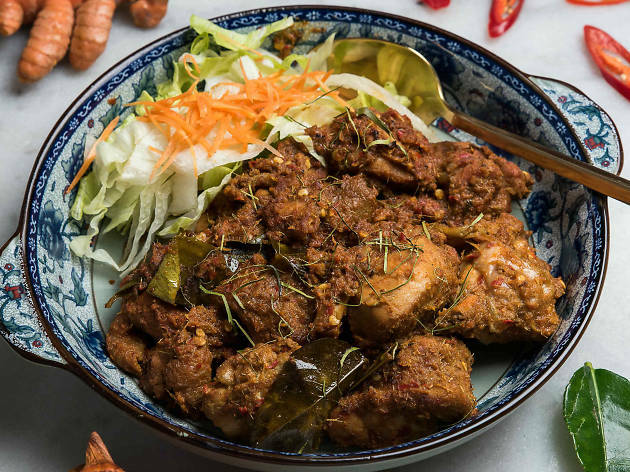 It's rich with coconut milk, thrumming with spice, ginger, garlic and lemongrass. 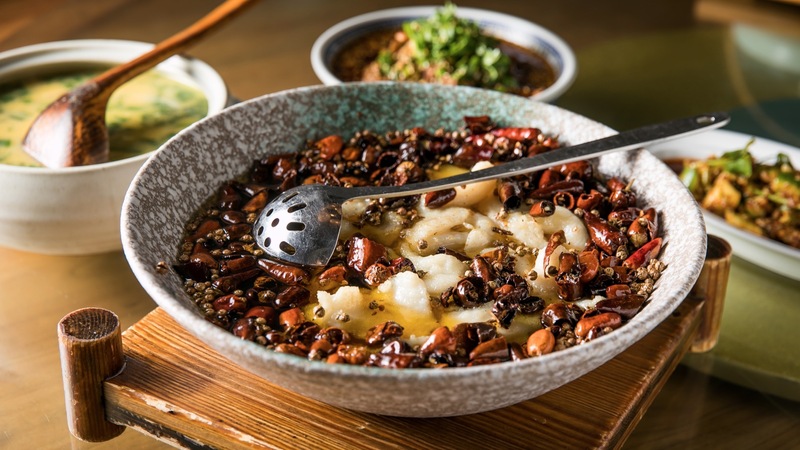 What it is that Sichuan food enthusiasts can’t get enough of is the unmistakable flavour imparted by Sichuan peppercorns, especially those in the food at Dainty Sichuan Noddle Express, an efficiently buzzy noodle house in World Square that has opened as a fast-casual edition of the beloved Melbourne restruant of the same name. 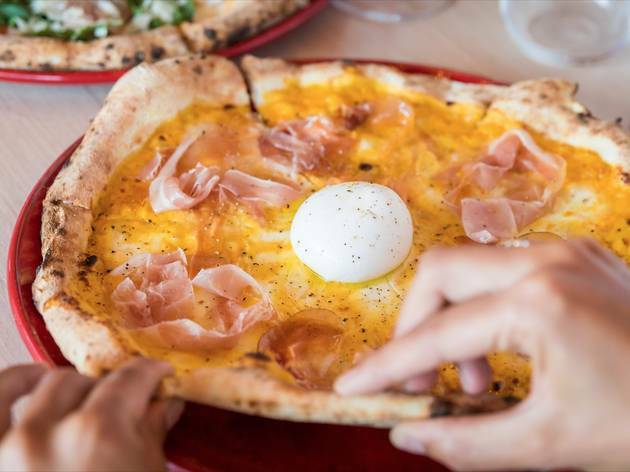 Nope, your fellow diners aren’t taking a test. 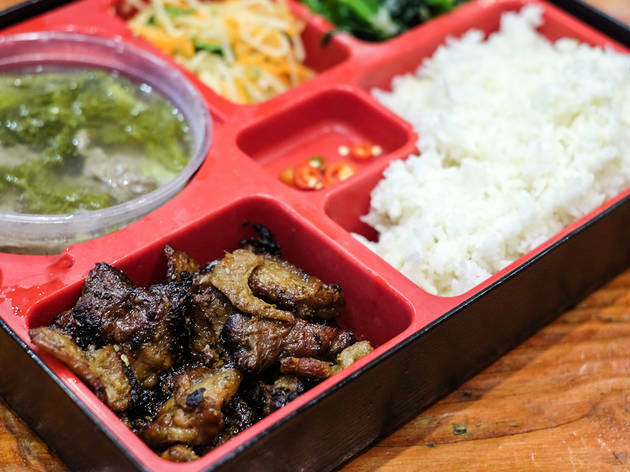 They’re customising their Vietnamese meal boxes on cleverly designed wipeable menus. 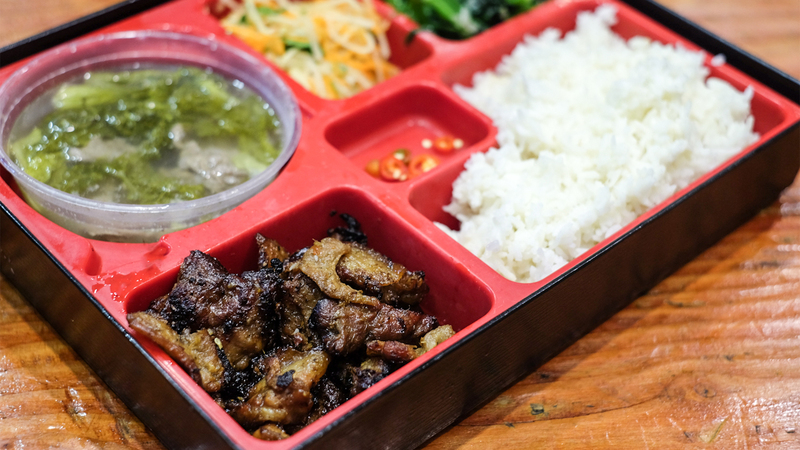 Choose your preferred rice, main, vegetable, salad and soup and it’ll all get assembled in a lacquered bento box for one. It’s hard not to agonise over the available options. You can smell it as soon you hit the main street of Granville. 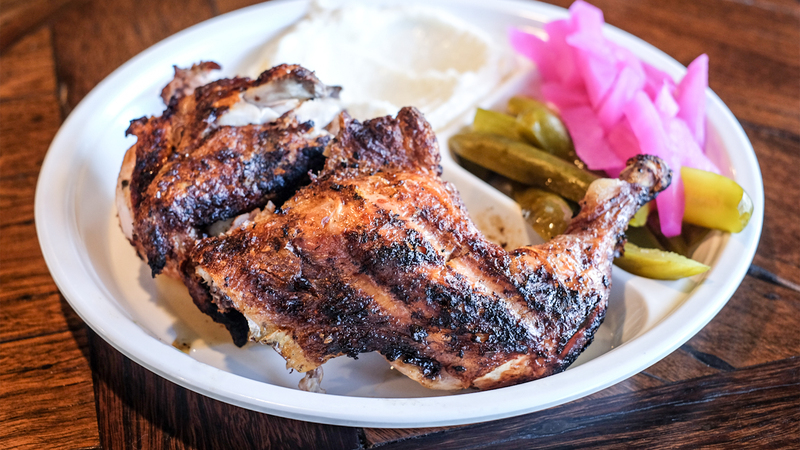 That’s the scent of chicken skin charring to a smoky crisp as fat drips and sizzles onto glowing charcoal below.This is barbecue chicken, Lebanese-style. 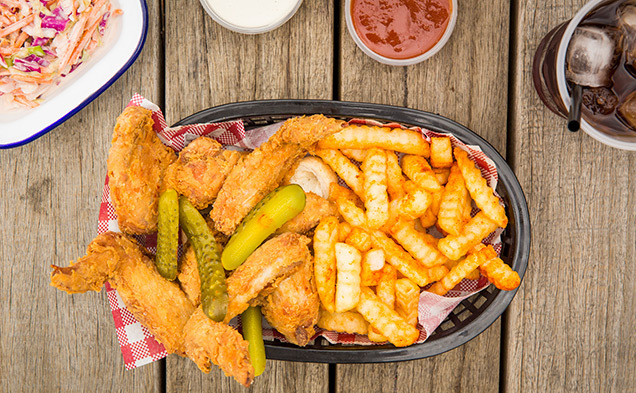 Garlic sauce is mandatory. 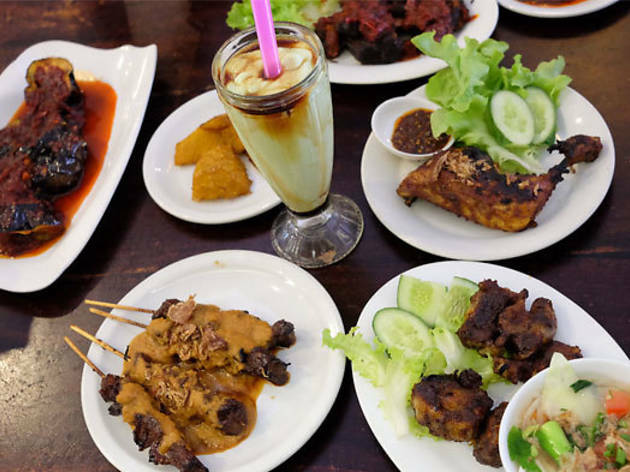 Unlike most Indonesian restaurants across Sydney that focus on Javanese cuisine, here you’ll find the food of Medan, the North Sumatran capital known for its distinct mix of indigenous Batak, Malay and Chinese flavours. 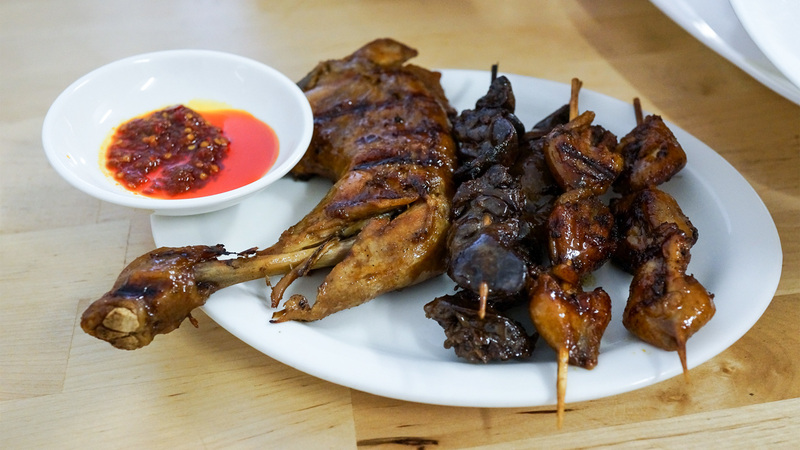 Expect lots of pork including regular cameos by Chinese lap cheong sausage. Believe the bib. When there are this many business workers prepared to wear a plastic bib at lunchtime, you know this is a laksa worth investigating. 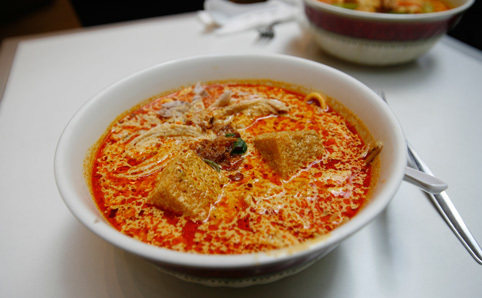 Weekday lunchtimes are always chaotic, with a queue of laksa lovers often trailing out the door. 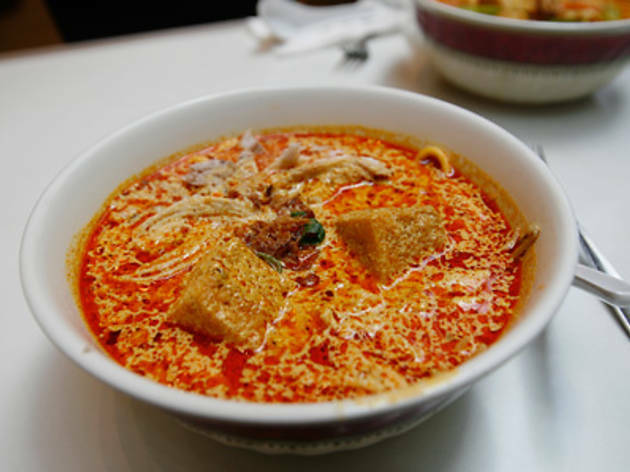 There are 11 laksa variations on the menu at Malay Chinese, but most punters stick with the standard chicken. 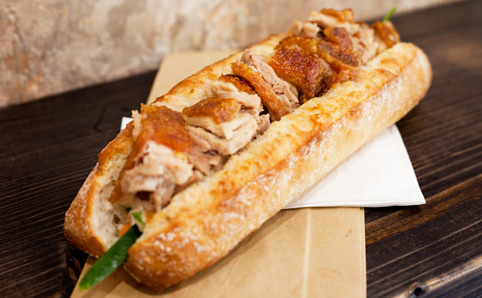 You can smell the roasting pork all the way down Oxford Street. 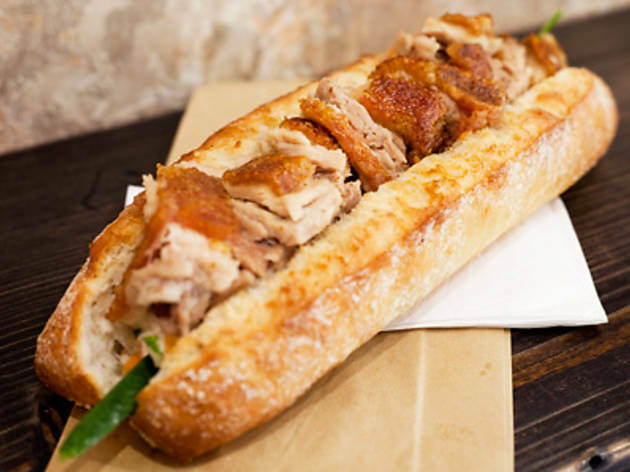 There are hotdogs, cheesy fries and salted crackling on offer, but go straight for those roast rolls starring tender, sweet fatty hunks of roast pork and shards of golden crackling on a chewy white roll with pickled carrot, cucumber and as much chilli as you can handle. 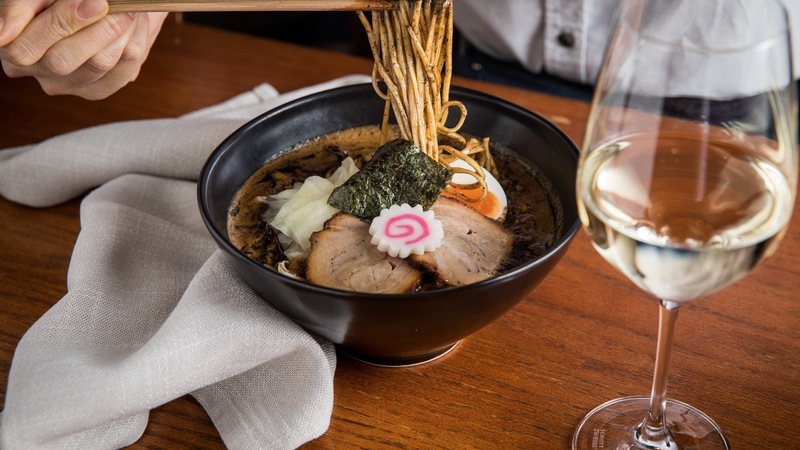 This Surry Hills Japanese hot spot specialises in a kogashi (which means ‘charred’ in Japanese) ramen, which sees a pan heated to a smoking-hot temperature before a dollop of miso paste is added and then it's deglazed with chicken broth. 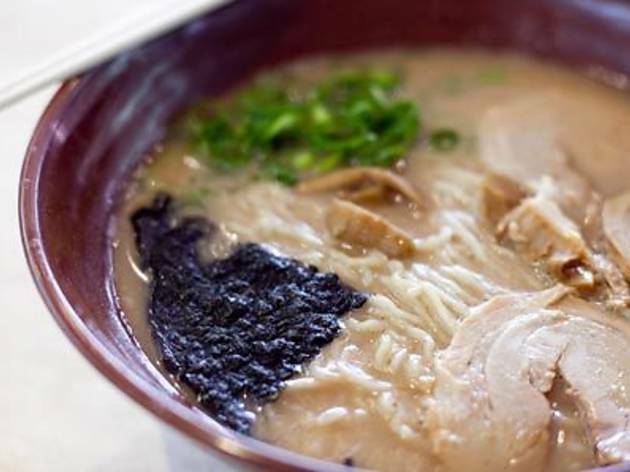 The resulting ramen is underpinned by a distinct smokiness that’s intense in flavour and appearance. 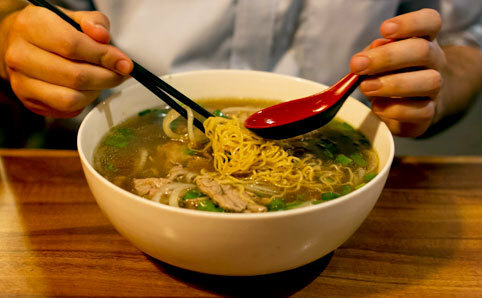 In Xi’an, they like their noodles thick. Really thick. This northwestern Chinese city in Shaanxi Province is the home of biang biang – fresh handmade noodles three fingers wide and as long as your arm. When tossed in oil mixed with roasted chilli, they make a fast, warm and filling bowl of cheap street food. 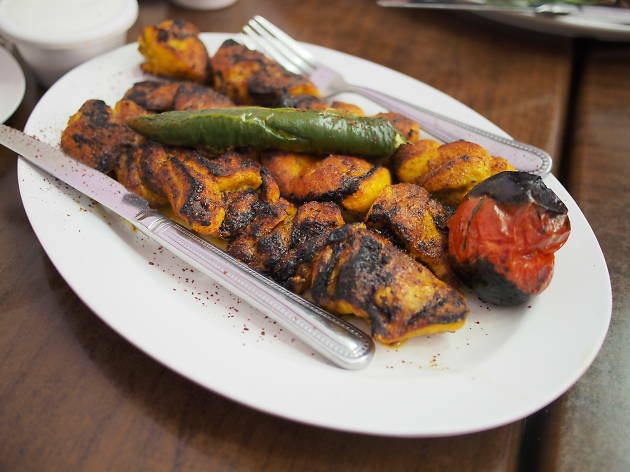 Afghan-style grilled lamb loin chops flavoured with salt and sumac, their tiny tails tender with juicy fat, are the tastiest bites you’ll get in this small barbecue shop in Merrylands. The kebabs they make here aren’t the cut-off-the-rotating-meat-stick kind you’ve scoffed after a big night. Nobody can watch their giant sized dosa arrive at the table without breaking out into a grin. It’s a banquet for one on a plate. Order the paper dosa for the extra thin and crispy version and get it filled with masala – chunks of spiced potato – for carb-laden satisfaction. 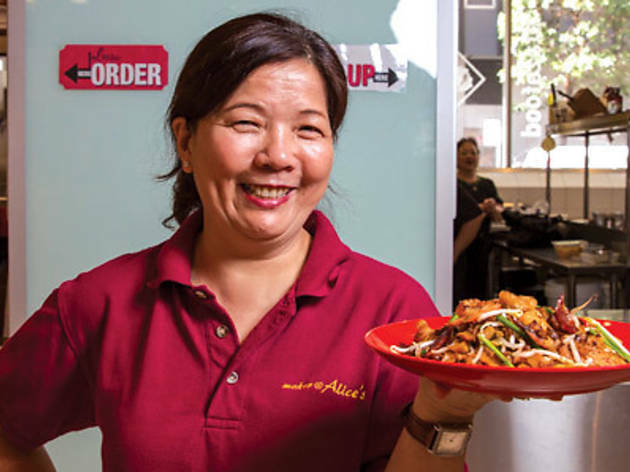 Tucked behind the Kensington Street laneway in Chippendale, the open-air courtyard is serving up hawker style dishes from across the globe. 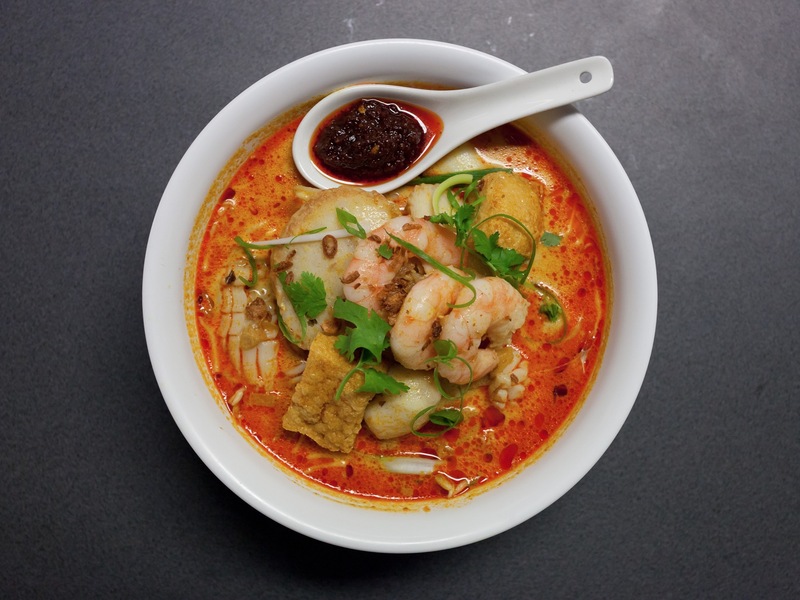 It's got Singaporean dishes, Thai and Vietnamese street food, Malaysian fare and Cantonese comfort food. And that's just the beginning. 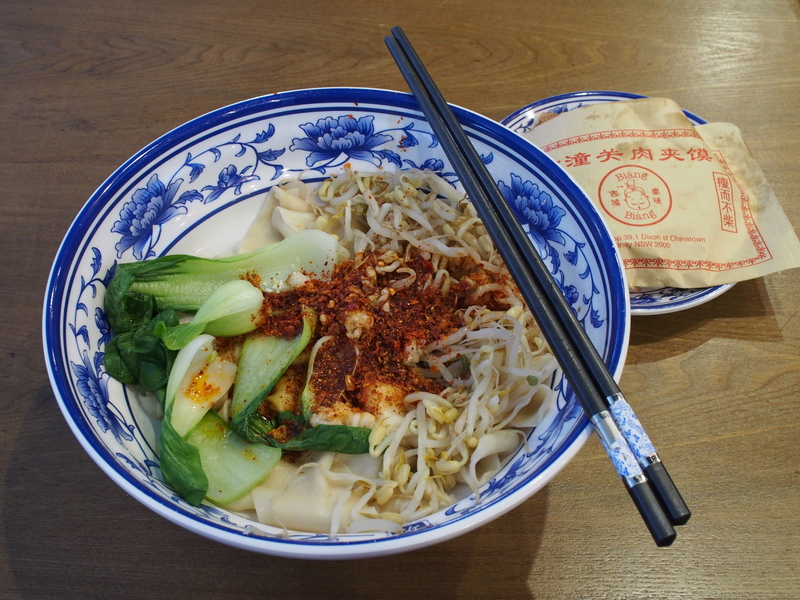 Spring Yunnan’s signature dish, ‘Crossing the Bridge Noodles’. 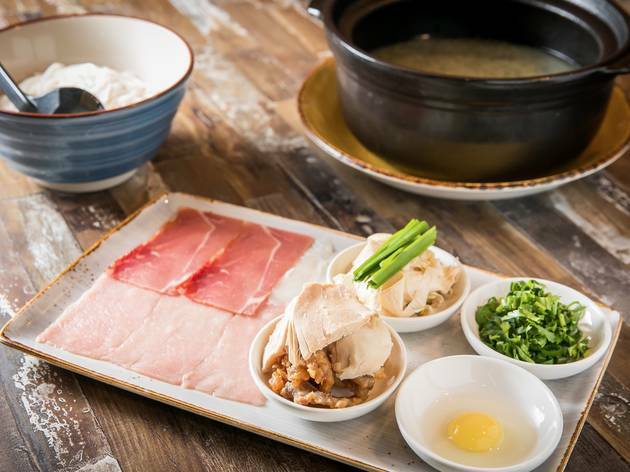 Resembling a one-person mini hotpot, the dish arrives deconstructed. 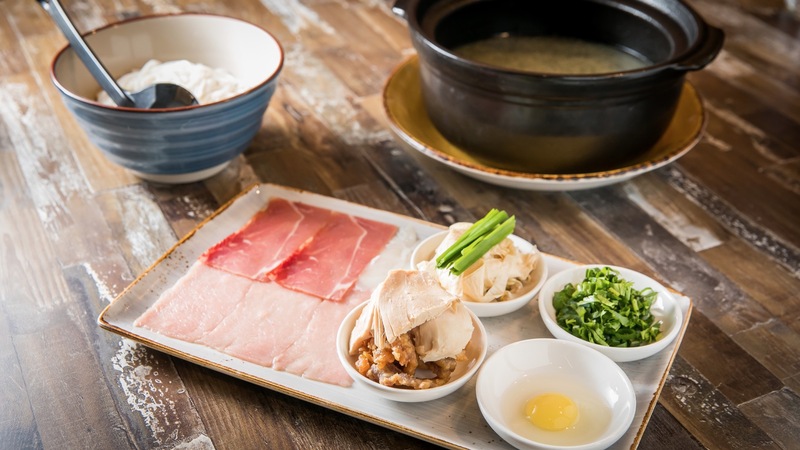 There’s a stone bowl of still-boiling pork and chicken broth, accompanied by an array of dainty plates bearing carefully chopped portions of pork, fish, chicken, prosciutto, coriander, shallots, garlic chives, bean sprouts, beancurd skin — even a tiny quail egg. 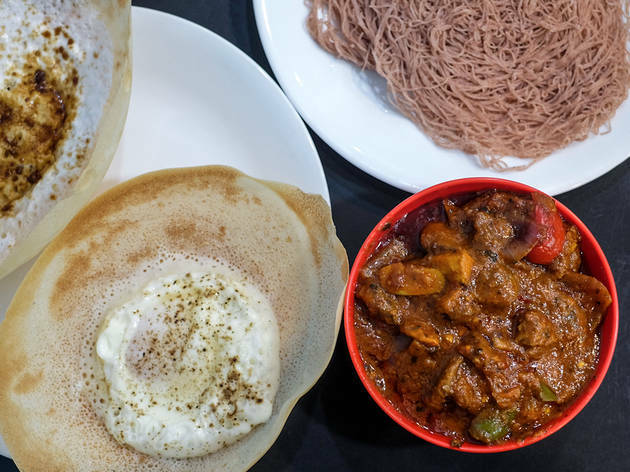 Make the trek to this humble dine-in and takeaway for Sydney’s finest (and cheapest) hoppers, Sri Lankan bowl-shaped crepes with an irresistibly crisp edge. They’re cooked to order here but do note, they’re only available after 4pm. 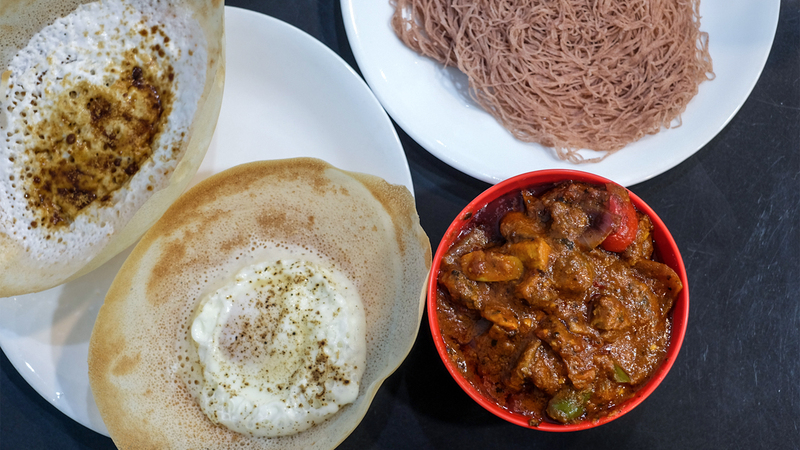 Get the egg hopper for extra protein and have it alongside your choice of curry from the bain marie. 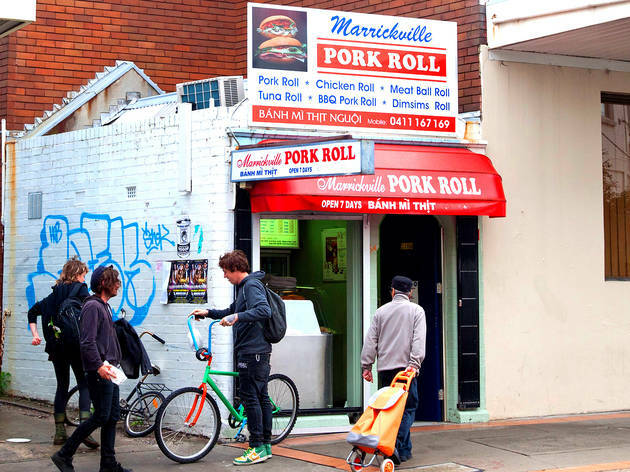 The Liverpool Road stretch of Ashfield is littered with dumpling houses these days but Shanghai Night was arguably the first. 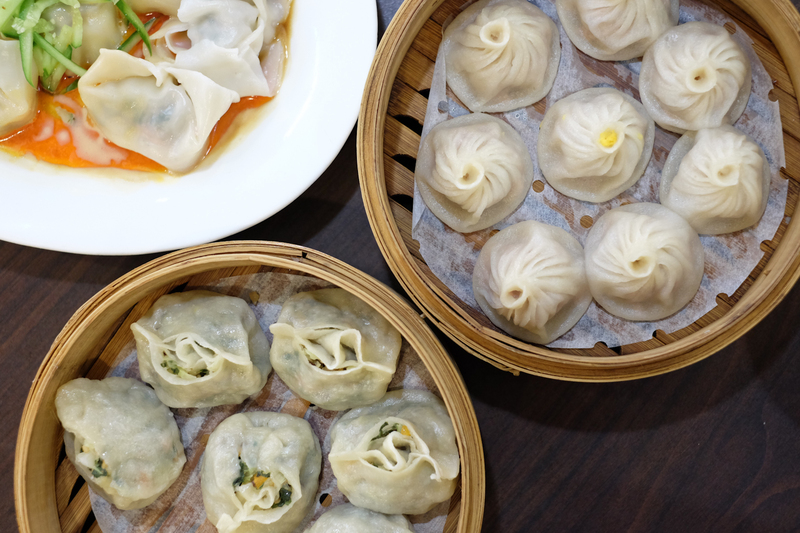 They’re still serving up some of Sydney’s cheapest xiao long bao soup dumplings at $7.80 for eight. But wait. There’s more. Steamed and fried dumplings arrive in hearty portions of 12 for the small serve, 18 for a large. Taiwanese snacks abound at this too cute eatery (also at Burwood, Chatswood, Kingsford, Rhodes and Wolli Creek) complete with hand-drawn (and coloured-in!) menu. 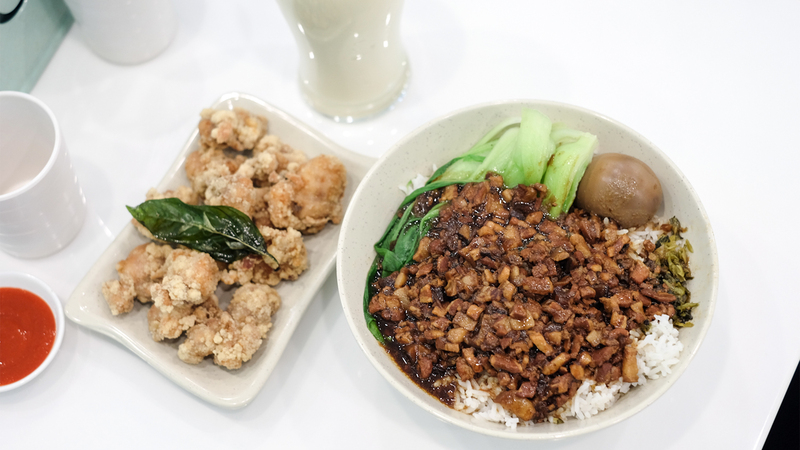 The national dish of lu rou fan or pork sauce on rice is serious business though, just $8.50 for the large size. It starts with the slowly spinning vertical rotisserie, jammed tight with chicken, lamb or beef mince. 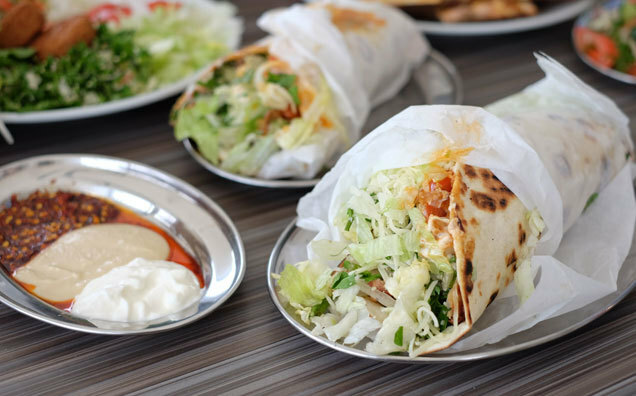 Pick your protein and they’ll carve on the spot, jamming it into a lightly toasted flat bread wrapped up with lettuce, tomato, onion and your choice of sauce. 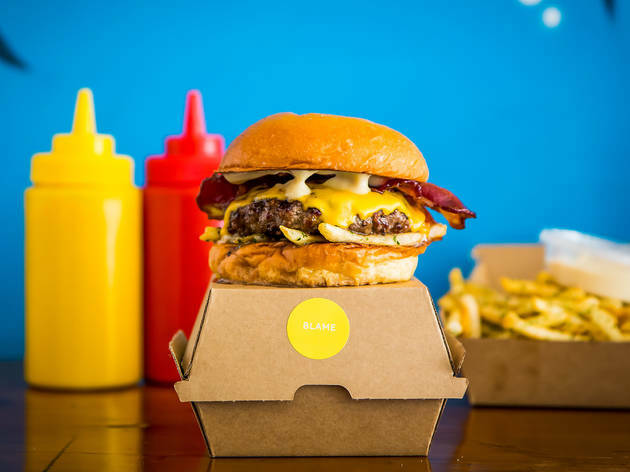 There are five burgers here, plus a special on offer, and sure, you could have a cheeseburger, but these guys are known for their riffs on the classics, so we say order the Blame Canada instead. It's a thick, pink-centred beef patty topped with crisp, maple-glazed bacon, double American cheese, poutine (fries and cheese curds soaked in gravy) and maple aioli. 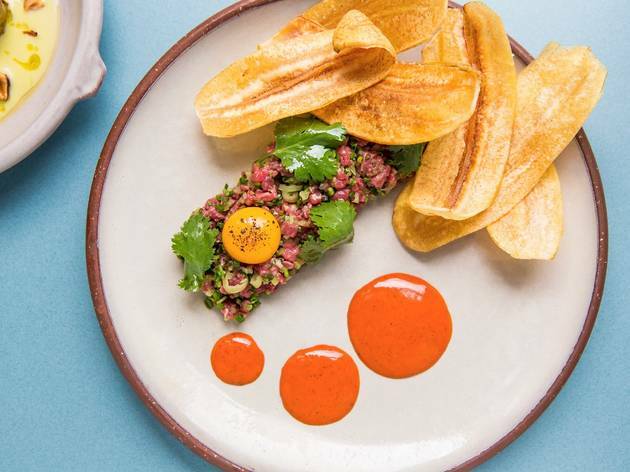 The menu is divided into three parts – Tipica (original, left-of-centre numbers), traditional (self explanatory) and even a vegan list (plant-based eaters in Bondi, rejoice). The less traditional styles are interesting and the most successful. 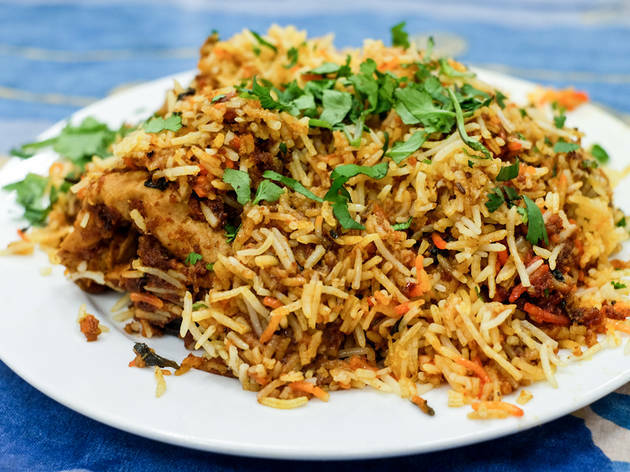 A favourite of the royal kitchens from the 16th century Mughal empire that ruled across the Indian subcontinent, cinnamon and clove infused rice is layered over pieces of chilli, cardamom and turmeric marinated chicken, then slow cooked until the flavours merge together. 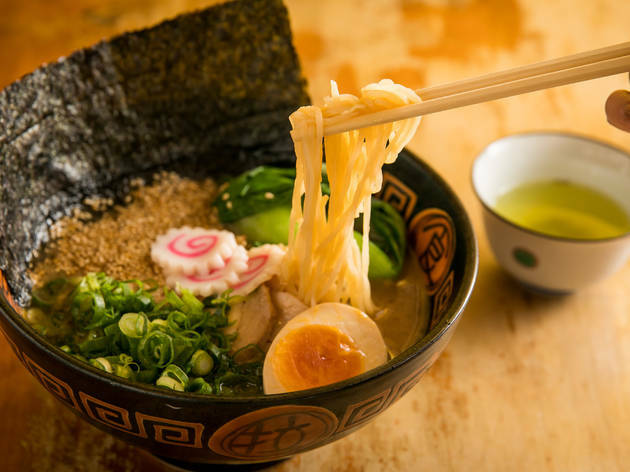 Practically everything on the menu here is under $15. No wonder this joint is always buzzing. 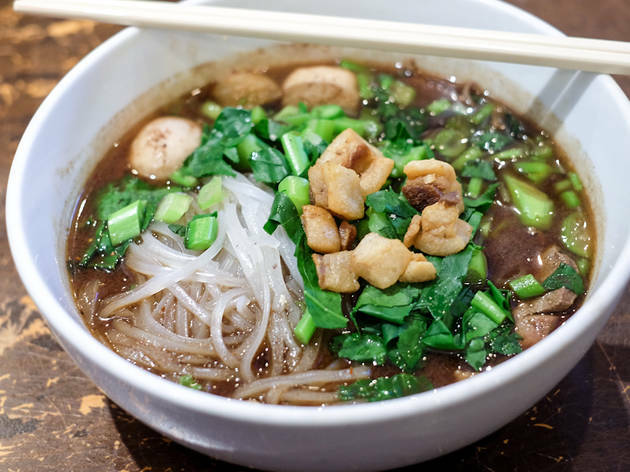 Sure you could stick with the classics but that would mean you’d miss out on local favourite, boat noodle soup. It’s a fragrant herbal soup enriched with pigs blood (think of the iron!) that tastes much better than it sounds. 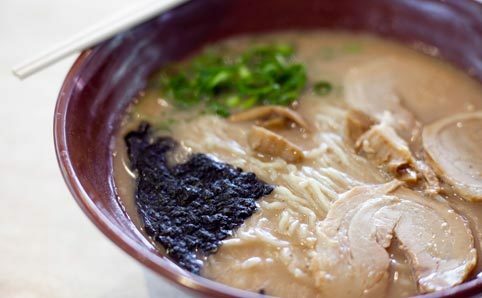 Inside the stark, fluoro-lit surrounds of Chinatown’s Eating World, this small ramen joint pumps out a seriously authentic tonkotsu broth made from just two ingredients: pork bones and water. 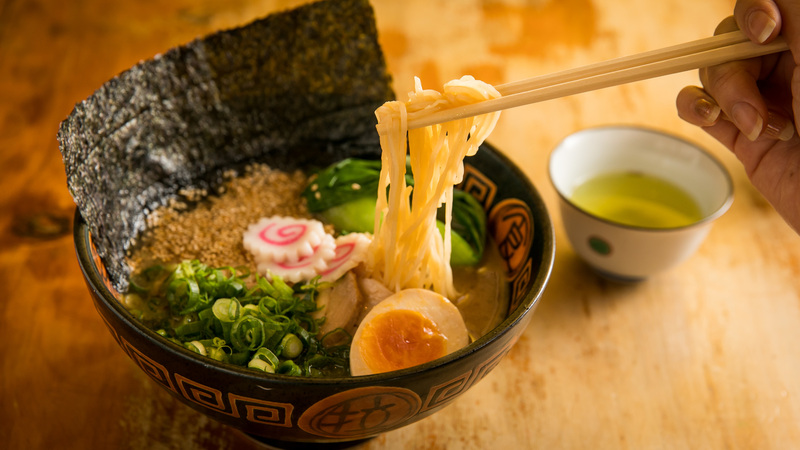 It leaves a collagen film in your mouth and it’s so dense you can barely see the noodles through it. 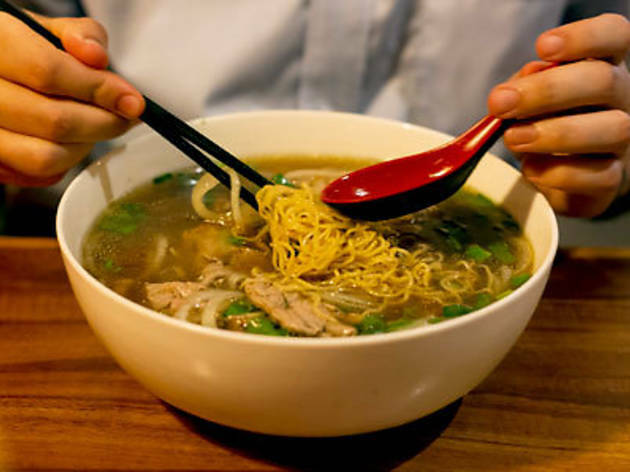 A good beef noodle soup can bring you back from the dead. 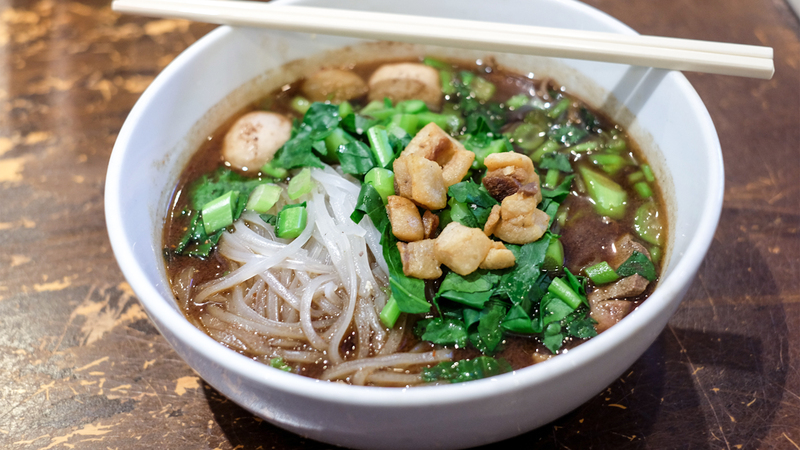 The combination of full flavoured beef broth, thin slices of beef, flat rice noodles and green onion cut with a squeeze of lemon and brightened with torn basil leaves and crunchy bean shoots is enough to revive the sick, the depraved and the downright hung over. 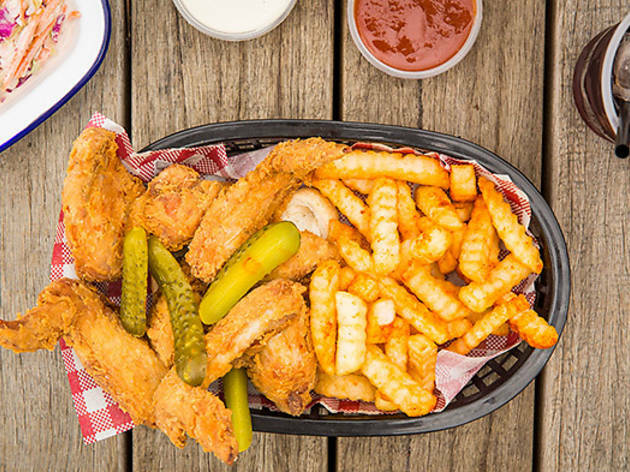 Melbourne’s popular southern-style eatery in Barangaroo is the answer to your waterfront cheap eat dreams. You can have a hot sauce-spiked fried chicken sandwich (with a side of natural wine if your budget allows) and stare out at the ferries pulling into the wharves. 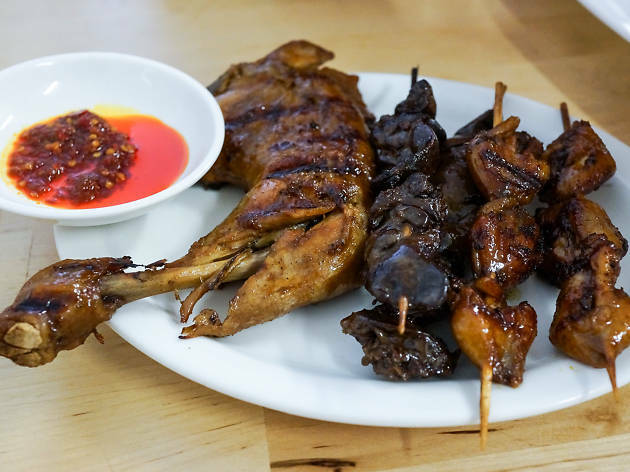 Ayam Bakar 7 Saudara specialises in Indonesian-style grilled chicken and the pasa bakar – thigh and leg pieces – is the juicier order, with skin that’s crisp and charred from the grill and meat that’s fall-off-the-bone tender. 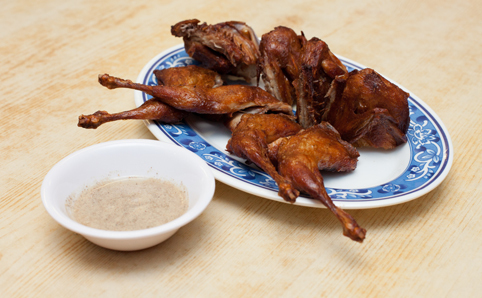 Go for the extended chicken experience with small grilled skewers of liver or giblets. 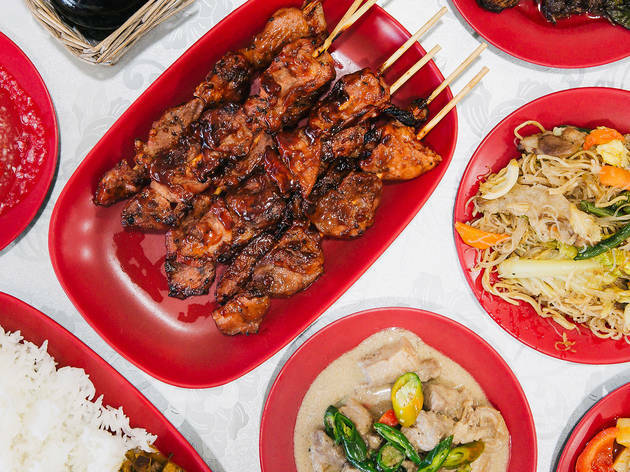 Located on the quiet side of Rockdale train station, Kapamilya Grocery and Eatery is a family run business serving up home-cooked meals, Manila-style. 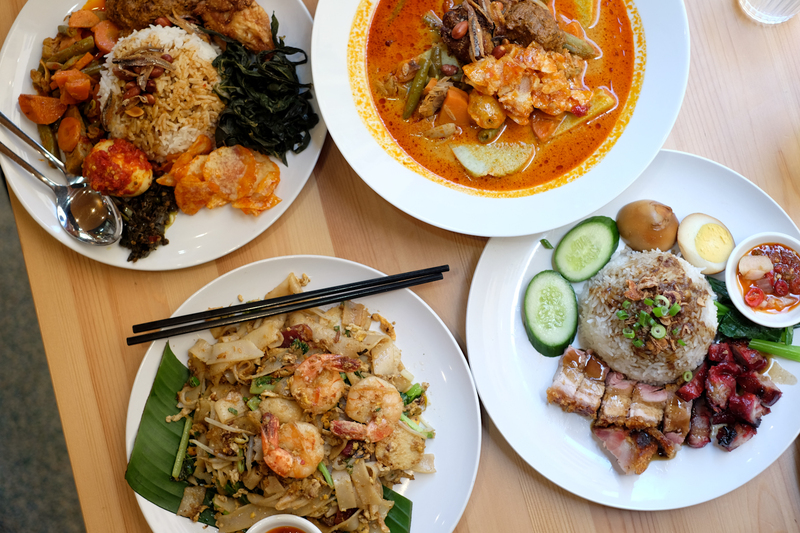 The menu changes daily but it’s always a bargain – you get a couple of selections on a single plate for under ten dollars, or you can share four or five dishes served up in smaller bowls and a pile of fluffy white rice. First up, it’s all about the bread: fluffy rounds of fresh pita, scorched lightly on the grill. 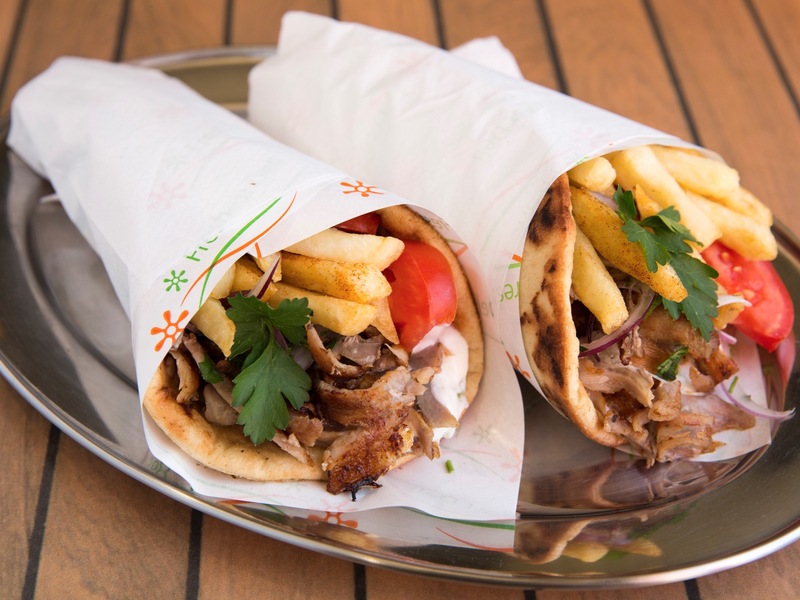 They're filled with slices of juicy pork or chicken – just like in Greece – carved straight off the vertical spit. There’s a smattering of salad: ripe tomato wedges, red onion, parsley and a slick of tzatziki, but mostly it’s one helluva meatfest. 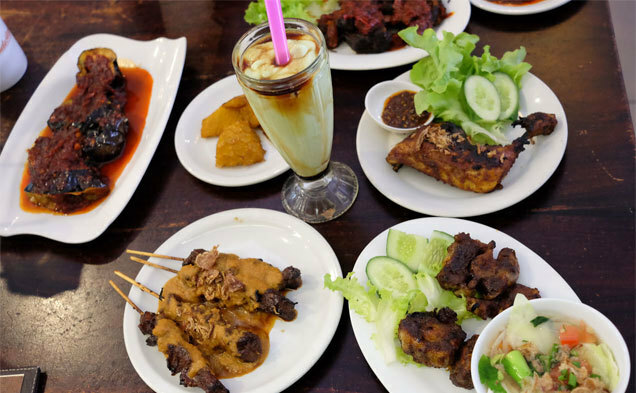 If you’ve always been unsure about what to order at an Indonesian restaurant, Indo Rasa is the perfect place to start figuring it out. The pictorial menu – that’s 61 shots spread over 11 pages – makes order-by-pointing a much more accurate exercise. 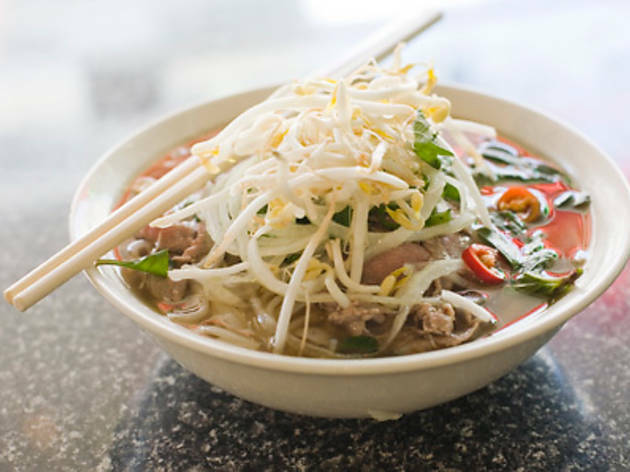 This Vietnamese noodle soup hits the spot at breakfast, lunch and dinner, and its restorative powers can’t be underestimated, especially when you’re feeling sick, seedy or hungover. Chirpy red bowls of fresh rice noodles are filled to the brim with a life-giving broth that is clear, sweet and not overly salty. 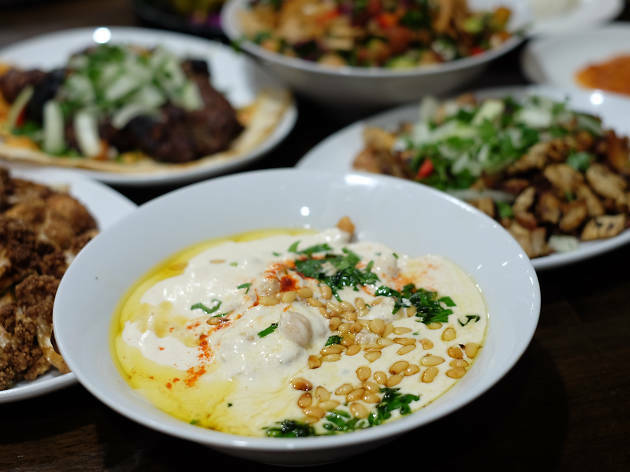 It’s time to embrace your inner fatteh. Never heard of it? 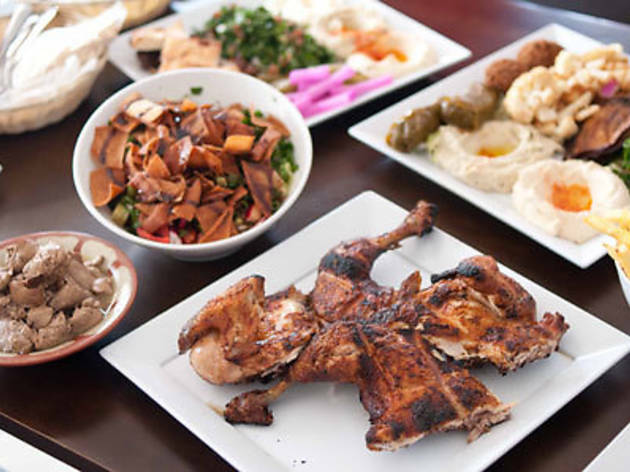 This nourishing breakfast dish is a staple in homes across Lebanon, Egypt, Jordan and Iraq. If you love chickpeas, you’ll adore this dish. 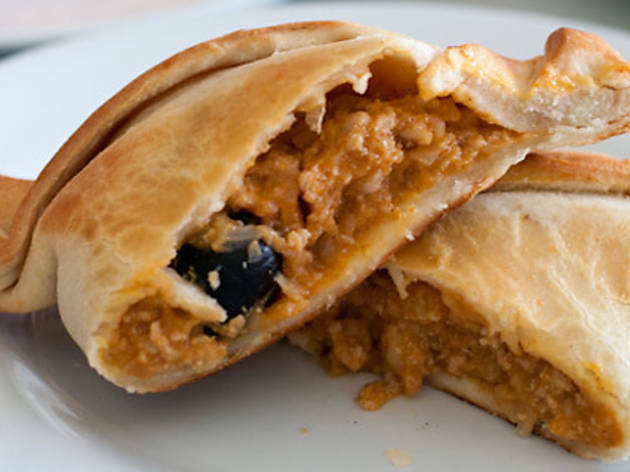 If you hate chickpeas, you’ll probably still love it. 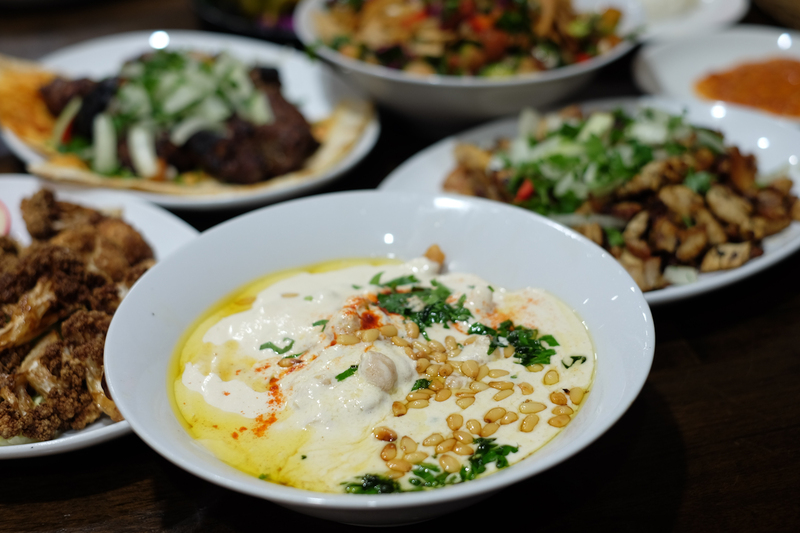 Follow the lead of locals and scoop up generous mouthfuls using soft and fluffy rounds of Lebanese bread. 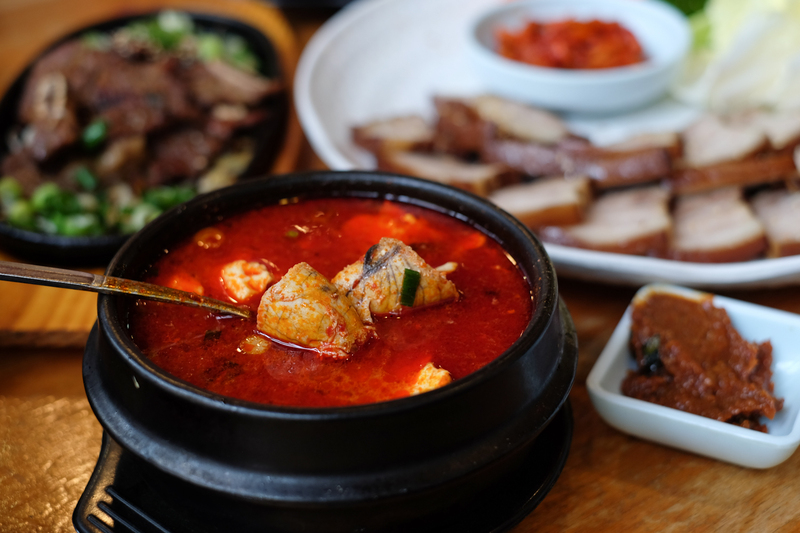 Soondubu jjigae. 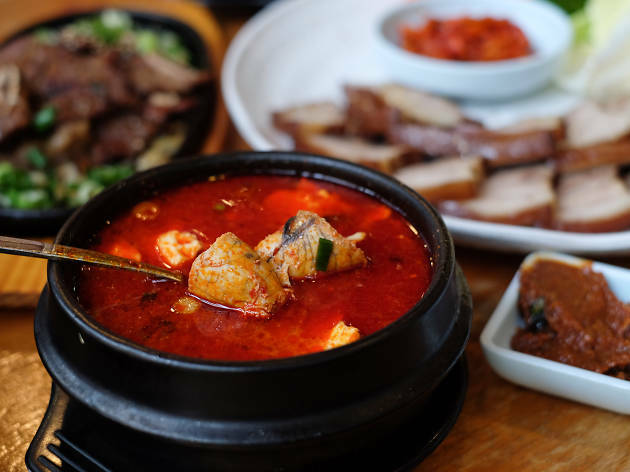 This Korean favourite is more than just a soft tofu soup. 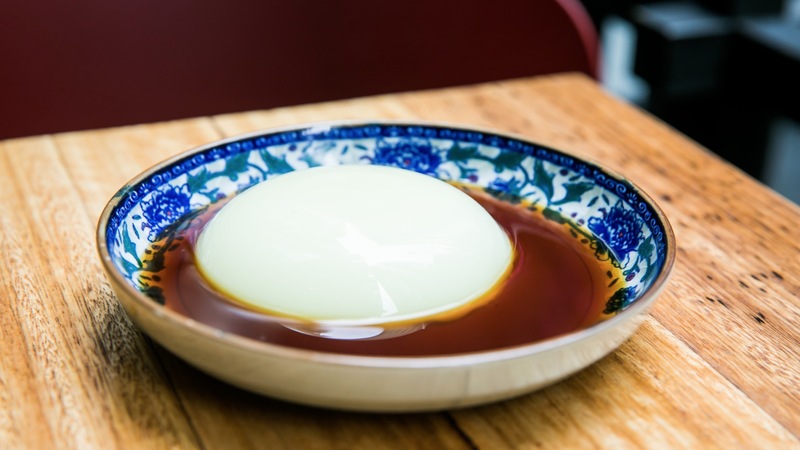 You get a quivering wobble of soft set tofu - like a savoury version of pannacotta - simmered in a mini cauldron of bubbling spiced soup. 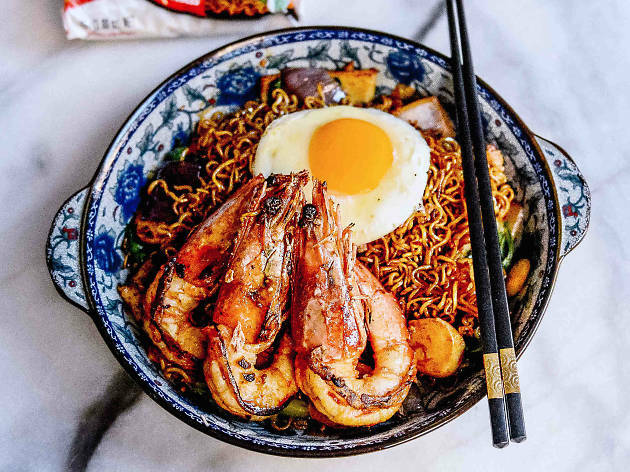 The broth is guaranteed to warm you up from the tips of your fingers right down to your toes, and don’t freak out about the angry red tinge – it’s not half as spicy as it looks. 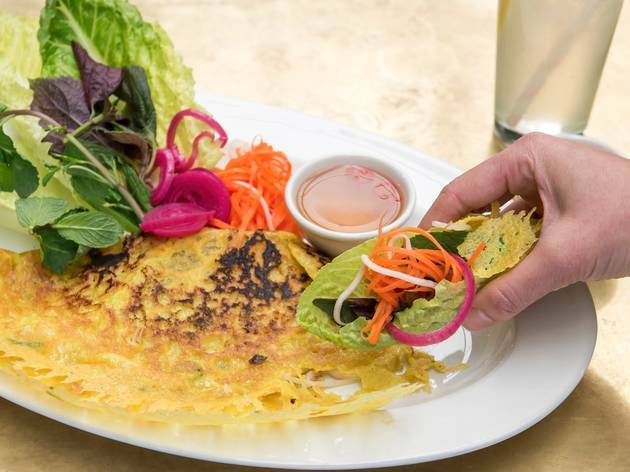 There’s one dish that everyone loves at Lao Village. 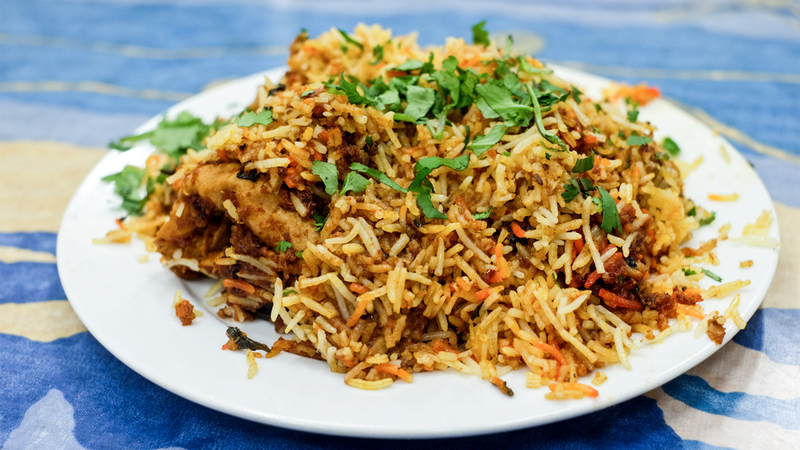 The crunchy fried rice ($9) is everything you could want in a meal: a mountain of rice, slices of Lao-style ham, shallots, peanuts and golden shards of crispy rice bits that everyone ends up scrabbling over. 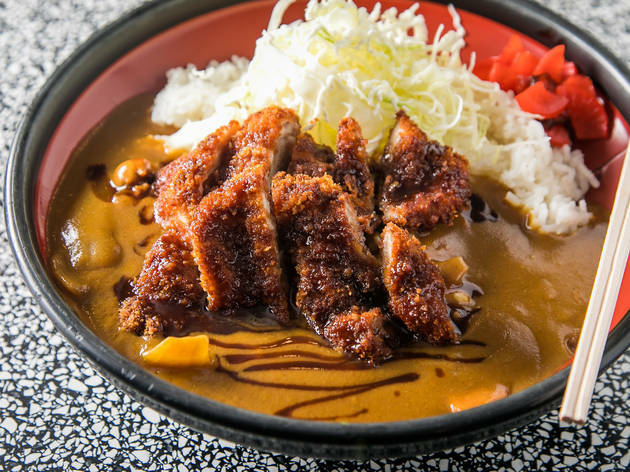 This has to be one of the best value meals in Chatswood, with a small serve costing less than a fiver. 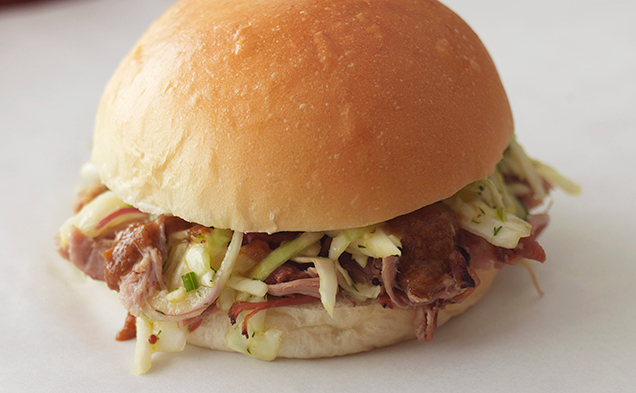 But if you really want to roll away try the special (or better yet share with with a mate or two). 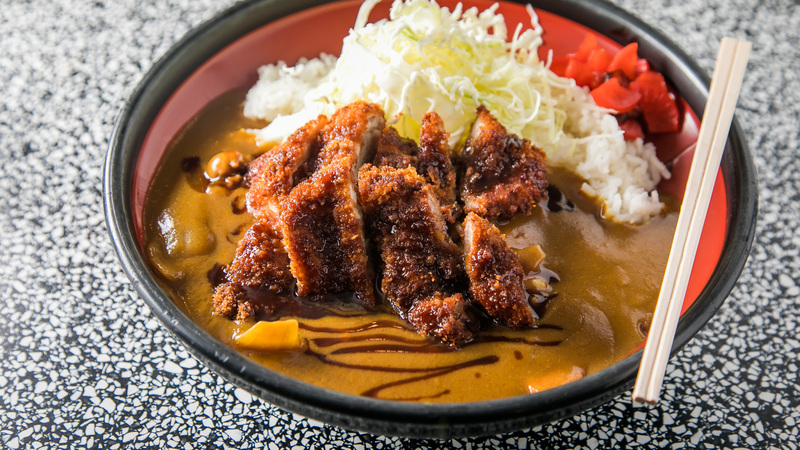 A half long wide platter of rice, four palm-sized pieces of sliced chicken katsu, and what looks like a litre of curry sauce for only $20. 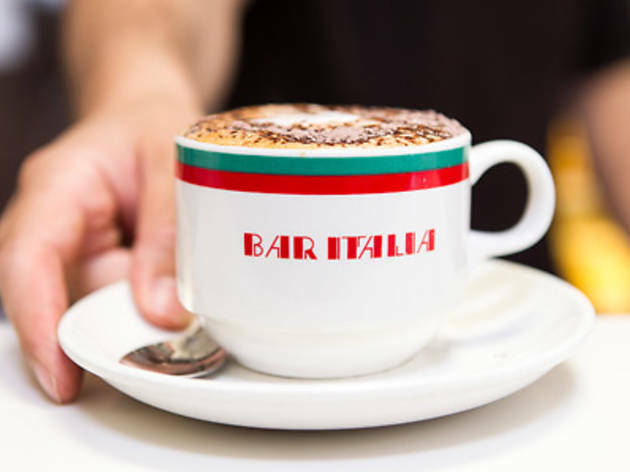 This is a proper red sauce joint – order at the counter, head out to the courtyard for a table, bring your own wine and shake all the extra parmesan you want out of one of those glass sugar decanters when your penne arabiata arrives. 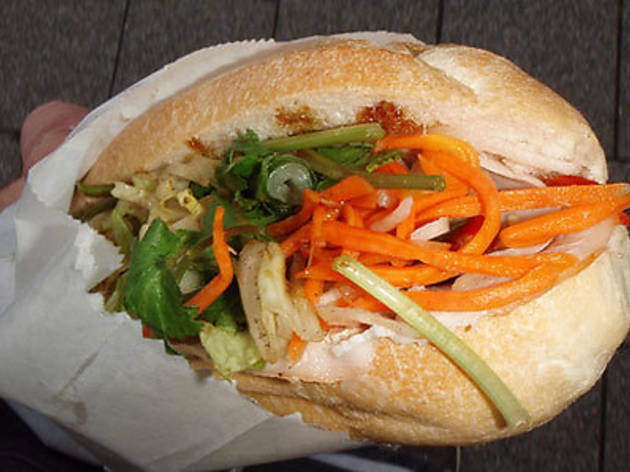 For the tastiest sandwich this side of the footpath, try Hong Ha – the king of banh mi (that Vietnamese specialty of a crusty bread roll spread with mayo and pate with a selection of mystery luncheon meats, coriander, soy, fish sauce and plenty of chilli). What is La Paula? 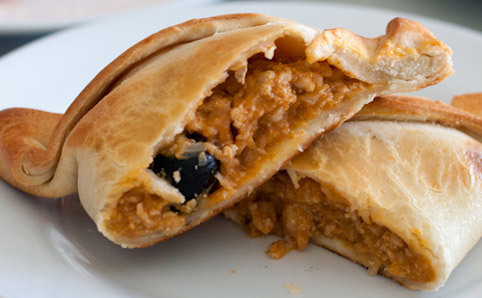 A Chilean bakery and café that specialises in empanadas and dulce de leche sweets. Step through the nondescript shopfront and you'll find a festive interior strewn with Chilean flags and giant crepe-paper rosettes. 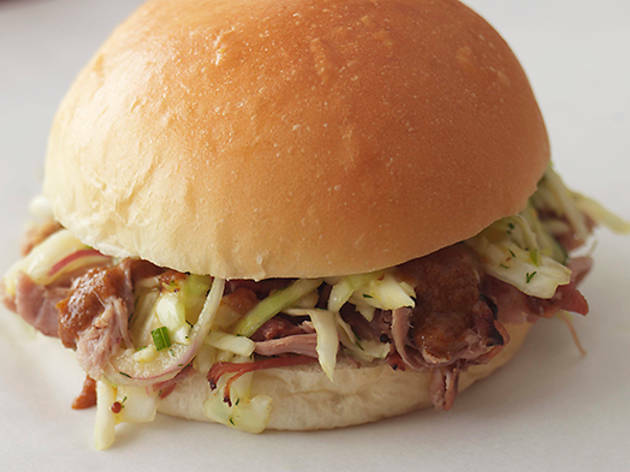 The lomito pork sandwich is Chile's answer to fast food. A towering lomito completo ($7.80) gives you the lot - tender pork slices, tomato, sauerkraut, lettuce and lashings of mayonnaise in a soft white bun. 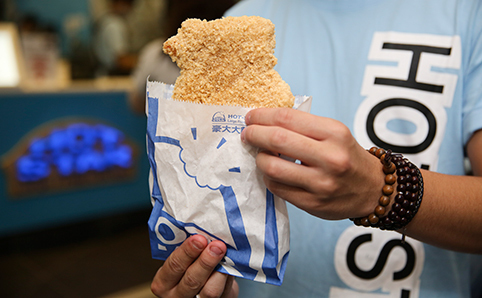 What started off as a popular Taipei night market staple has now hit the inner city. 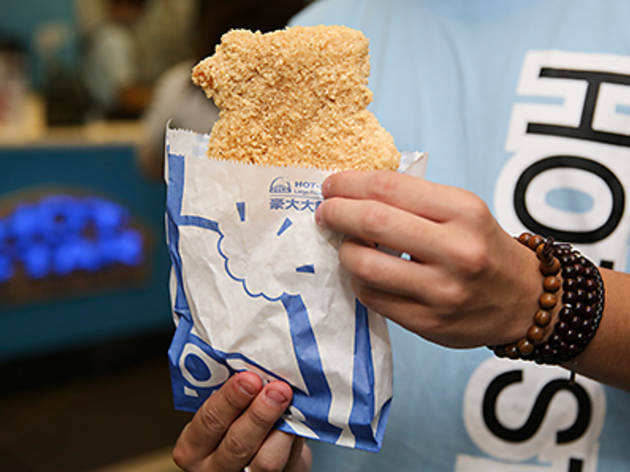 The largest Taiwanese-style fried chicken served in a paper bag is as close Sydney’s ever come to actually having street food. 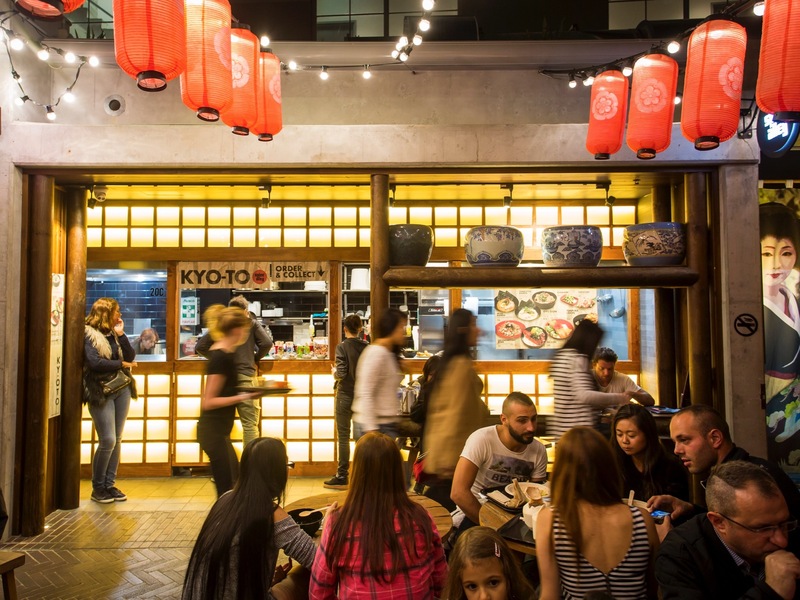 No, there’s nowhere to sit – it’s really just a tiny neon-lit shopfront – and yes, you have to queue. Got a bit of cash to splash?